We got a request on making a string/pad tutorial. First we will look into creating string like sound and in the second part of the tutorial we will transform that sound into more pad like sounds. To create simple string sound we will stack couple of harmonically tuned operators to produce rich harmonic content. This technique is more similar to additive synthesis which is great for producing complex and rich pad sounds. First we will use two operators for creating basic string/pad sound. For string sound we will need saw wave for our starting waveform, for brass sound we would use triangle or square waveform instead. To get saw wave we can use modulators modulating carriers with odd ratio values such as C:M = 1:1, 3:1… This will produce both odd and even multiples of fundamental frequency opposed to ratio C:M=2:1 which would produce square waveform which has only odd harmonic content (or narrow pulse like waveforms at higher odd number ratio settings for modulator). Instead we could also use self-modulating operators to get the saw waveform, but in this tutorial we will rather experiment with different waveforms available in FM8. Enable operator E and F and set them both to saw wave. Set operator’s F ratio to 1 and operator’s E ratio 3. We should also detune bot of our operators a bit so it wont sound too perfect and artificial. I’ve set offset of both operators to 0.80 Hz and -0.80 Hz. Set operator E to modulate operator F with small amount, like 10 or so. We have to be careful with this settings since we are already using complex waveform instead of sine, so high amounts of frequency modulation produces noise much faster than it would with using normal sine wave. I have also applied pan to output of both operators. Also operator A should be set to a bit lower output level. We should also add some LFO modulation to the amplitude of the oscillator to produce slight variations in the amplitude of operators so the string sound in the sustained part doesn’t sound too static. The envelope settings for both operators highly depends on articulation of the string sound you want to achieve. For shorter notes be sure to set quite short attack, quarter of a bar or so but if you want to play long and big chords you should set quite long attacks for both of the envelopes we are using. Envelope of operator F could have a little shorter attack and higher overall envelope amplitude than envelope of operator E if we would want to introduce overtones to the sound a bit later than the prominent fundamental part of the sound. We can get many different flavors just by changing shapes of these two envelope. Also you should add few breakpoints to your envelope like in the picture below to simulate natural movement in the string tone. This can greatly improve you string sound and add some variation to the sound. Note that operators E envelope is looped. Also if you want to play big chords you should use key scaling to scale the amplitudes of oscillator relative to the notes values. Here you can see I’ve scaled it so the higher notes will be playing with less volume than the lower ones. I have done this because there is otherwise too much high frequency content in the sound which makes string sound unnatural and synthetic. One last step is to use some kind of stereo spreading effect. I tried both reverb and chours/delay effect and the later works better in this case. Set it to something like this. Here we go this is our basic string sound. No effects are used. It isn’t too bad maybe not too realistically sounding but with careful use and also some volume automation and EQ I think it could do it’s job in the background of the mix quite nicely. Now let’s also add a third operator for the highest part of our sound. 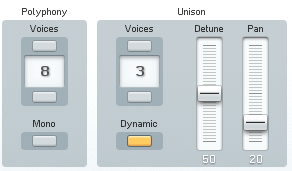 Enable operator D, set it’s ratio to 5 and choose 4th Formant waveform. It works a bit nicer than another saw wave for this purpose since the this waveform produces a bit softer sound than saw wave so the highest frequency component of the sound doesn’t sound too intruding. Set the attack of the envelope to quite slow so these high frequencies are introduced slowly into the sound. Also Im modulating operator D with both operators E and F. This introduces harmonic sidebands to the operator D waveform preventing it from sounding too clean and detached from other layers of our sound. Here are few chords played. Again, no effects are used for these samples but I highly recommend making some cuts with EQ and additional touch of reverb to improve the sound. It is really easy to produce all kinds of pad sounds with this additive synthesis technique. The principles are very much the same. Just by changing envelopes and waveforms you can get completely different sounds. Also try changing operators ratio values for variations and also add another operator(s). Here you can see I have added another operator, loaded with sine wave which is modulating other three oscillator which produces timbre changes resulting in a sweep at the end of the note. With this and similar techniques you will get more classic FM pad sounds. Here we go. Hope you have enjoyed this tutorial and learned something new. If you have any other general sound synthesis requests, questions or comments feel free to leave them below or on our Facebook page.